Ten award-winning family-owned locations with daily delivery in Chicago and all suburbs. Voted Best Florist in multiple polls. 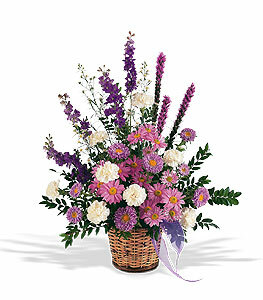 Beautiful fresh flowers, plants and gift baskets for every occasion. Satisfaction guaranteed. Since 1923. Located in Chicago, Downers Grove, Elmhurst, Hinsdale, La Grange, Lombard, Naperville, Oak Brook, Westmont, and Wheaton. 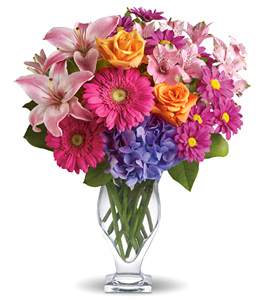 Phillip's Flowers is a family-owned, full-service florist with ten award-winning locations specializing in fresh flowers, plants, and custom floral arrangements, with daily deliveries in Chicago and 150 suburbs. 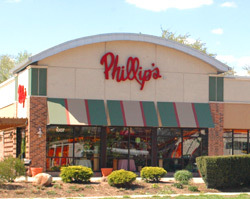 An Illinois Merchant of the Year, with locations in Chicago, Downers Grove, Elmhurst, Hinsdale, La Grange, Lombard, Naperville, Oak Brook, Westmont, and Wheaton, Phillip's Flowers offers ninety years of proven reliability for all your floral gift sending throughout the greater Chicago, Naperville and Wheaton areas. Satisfaction guaranteed. Member SAF, FTD, and Teleflora. Specialties include premium roses, fresh bouquets, custom arrangements, wedding flowers, event decorations, funeral flowers, sympathy expressions, plants, gift baskets, and balloons. 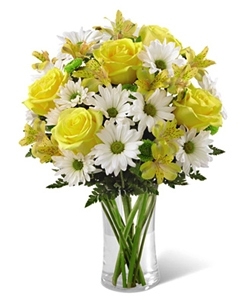 Easy to use website, flowers delivered on time, and they were beautiful. 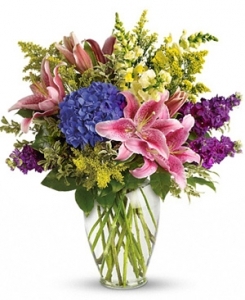 The recipients of the flowers were delighted with them and rang to express their pleasure, describing them in detail. Thank you Phillips Flowers . When one orders from another country it's good to know the quality is of a high standard. Excellent service. Delivered in Chicago less than 3hrs after placing order in uk. My fiance is very happy when he received the flowers.. Thank you for being on time!! You're the best!! Until next time.. 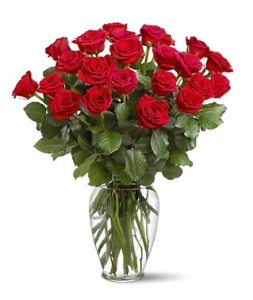 Knock someone's socks off with two dozen gorgeous roses vased with fresh foliage. 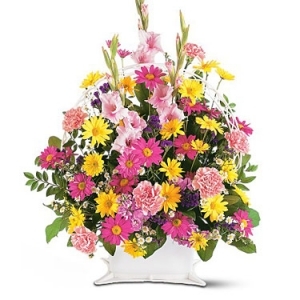 A stunning collection of seasonal fresh flowers to express your love and caring. 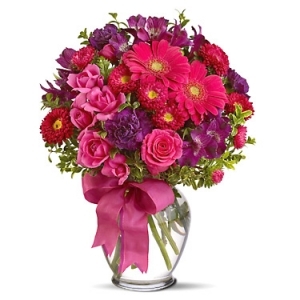 A stunning fresh garden bouquet in red and purple hues. 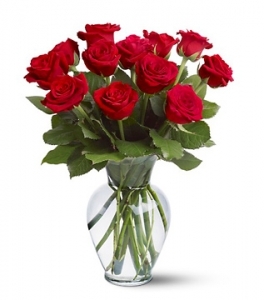 Send one dozen beautiful red roses tastefully designed with fresh foliage in a quality glass vase. 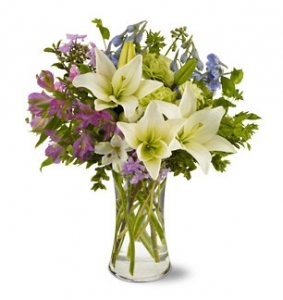 A stylish collection of fresh garden flowers designed and delivered in a clear vase. 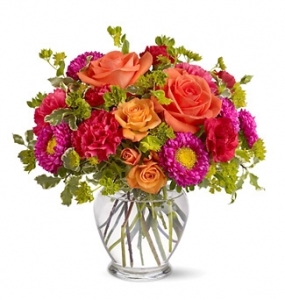 Send style and color with this lovely combination of fresh seasonal blooms. One of our most popular bouquets ever. 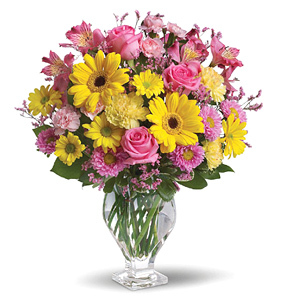 A glorious celebration of pretty pink and yellow blooms designed and delivered in a stylish glass vase. 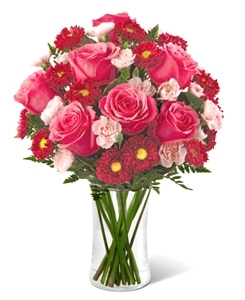 Send your love with pretty pink roses and more. 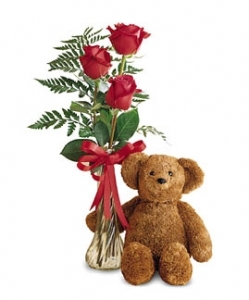 Show someone how special they are with six beautiful red roses vased and a huggable teddy bear, too. 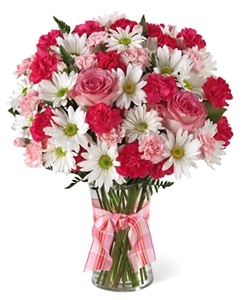 A sweet sweet vased bouquet in pretty pink, green, and white hues. Ffeaturing roses, alstroemeria, green buttons, or similar fresh blooms, in a contemporary compact design that is great for any desk or table. 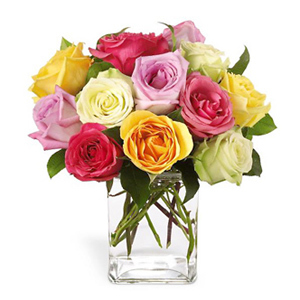 A stylish bouquet of one dozen assorted roses nestled in a clear glass vase, rectangle or cube. 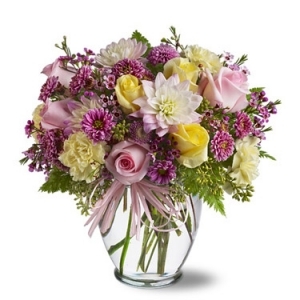 Soft pink, purple and lavender blooms designed in a classic vase. 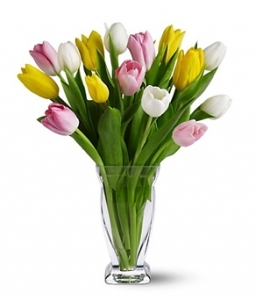 Assorted Spring tulips delivered in a glass vase. 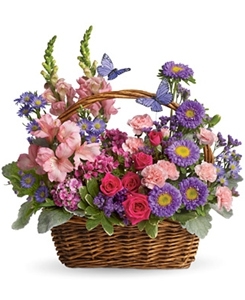 This Spring basket bouquet features fresh daisy poms, lilies, mini carnations, statice, iris, or similar fresh favorites in soft pink, purple, white, and peach tones. Great for a thank you, Motherâ€™s Day, feel better, or any thoughtful expression. Available late January till early May. 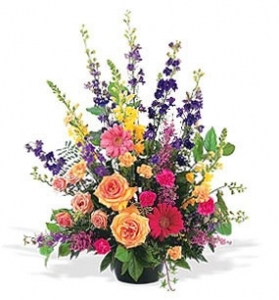 A colorful combination of roses, carnations, miniature roses, asters or similar fresh flowers. 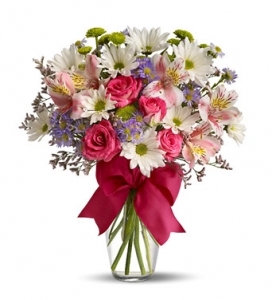 Beautiful pastel blooms to show how much you care. 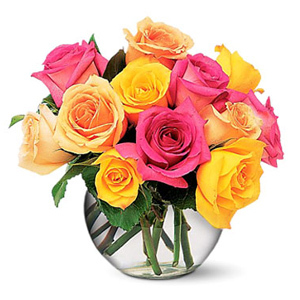 Send a lovely bouquet of assorted color roses in a contemporary cluster style design. 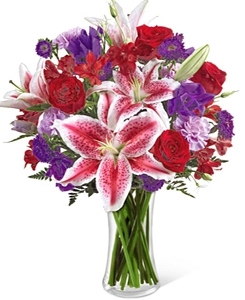 Fancy lilies, roses, and lavender accent flowers combine for the perfect combination in this popular vased bouquet. 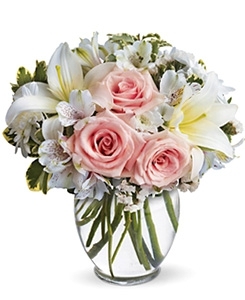 White and pink bloxxoms in an elegant compact vased bouquet. 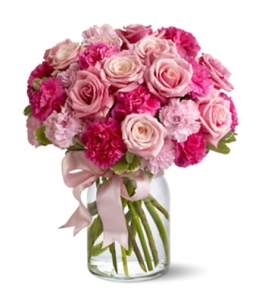 A wonderful combination of assorted pink roses and fluffy fresh carnations. 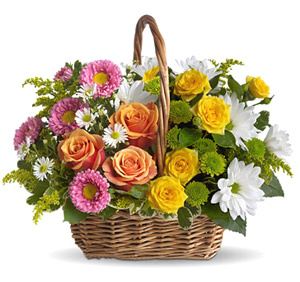 A charming basket bouquet of fresh roses, daisies, and more. 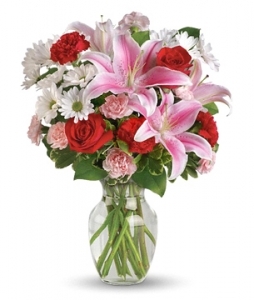 It's easy to say 'I Love You' with this heavenly bouquet of Oriental lilies, roses, carnations, daisies, and more! 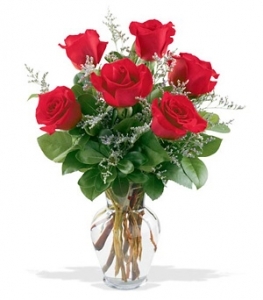 Six premium, fresh from the farm roses arranged in a glass vase with foliage and tasteful accents. 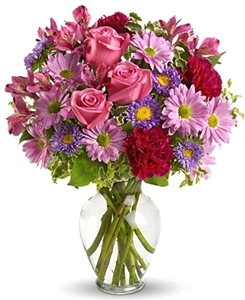 Brighten someone's day with this colorful bouquet of fresh seasonal blooms, such as roses, Gerbera daisies, asters and more. 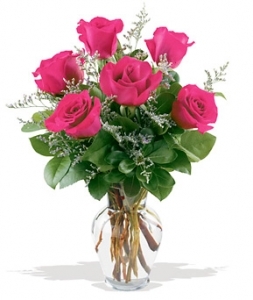 Six beautiful pink roses arranged with greens and delicate accents to express your admiration, appreciation, gratitude or caring. Great for almost any occasion! 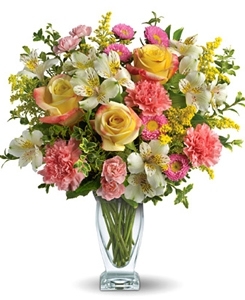 This pretty vased bouquet features daisy chrysanthemums, miniature roses, button poms, monte casino, alstroemeria, or similar seasonal fresh flower favorites. 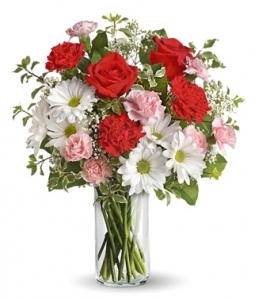 Make someone's heart skip a beat with this popular design of fresh roses, carnations, daisy poms, miniature carnations, baby's breath, or similar seasonal favorites, in pretty red, white, and pink tones. 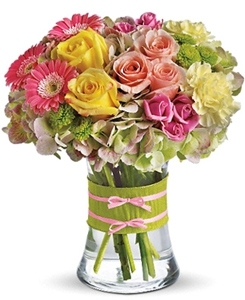 Pretty pastel flowers in a stylish basket bouquet. A gift of sunshine to lift anyone's spirits. 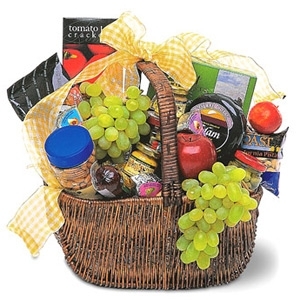 A bountiful gift basket of individually selected fresh fruits and goodies. 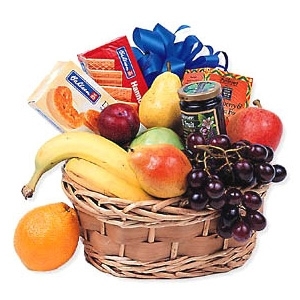 A custom assortment of fresh fruits and goodies in a handsome gift basket. 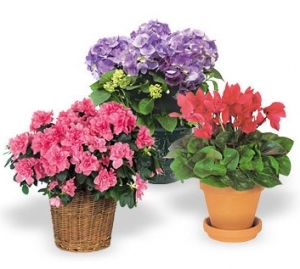 Send your warmest wishes with a beautiful long-lasting blooming plant! 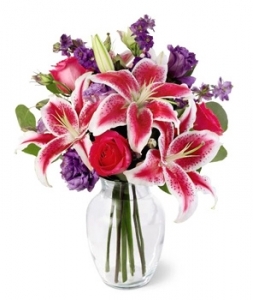 A tasteful combination of fresh lilies, delphinium, alstroemeria or similar seasonal fresh flowers. 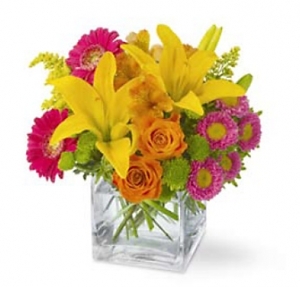 Send smiles with this colorful bouquet of fresh lilies, roses, Gerbera daisies, asters, solidago, or similar seasonal blooms in a glass cube or vase. 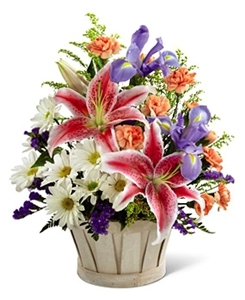 Get someon's attention with this colorful bouquet of fresh seasonal blooms in red, purple, lavender, and orange hues. 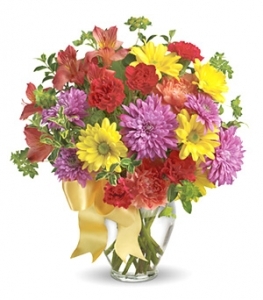 Featuring astroemeria, carnations, daisies, chrysanthemums, or similar hearty favorites. Designed and delivered in a glass vase. Great for a birthday, get well, thanks, congratulations, or just because. 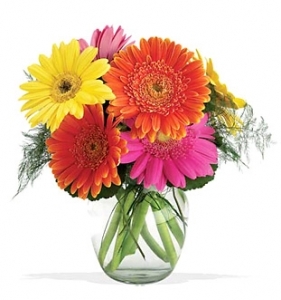 A colorful assortment of fresh cut Gerbera daisies in a fanciful vased bouquet. 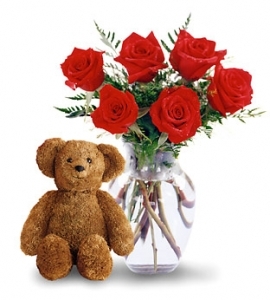 Warm someone's heart with this sweet combination of three red roses in a bud vase and an adorable teddy bear, too. 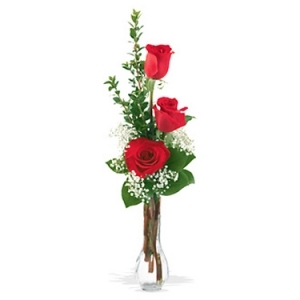 Share the simple beauty of three red roses displayed in a bud vase with a touch of fresh accents. 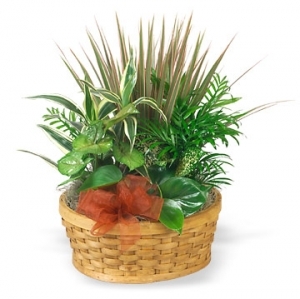 A custom assortment of tropical indoor plants that are long-lasting, easy to care for, and perfect for home or office. 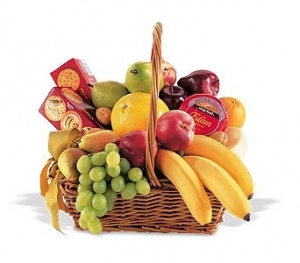 A custom assortment of seasonal fresh fruit nestled in a gift basket with cheese, crackers, or similar tasty treats. 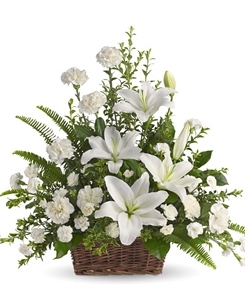 A pure white sympathy arrangement for the wake, memorial, or home. 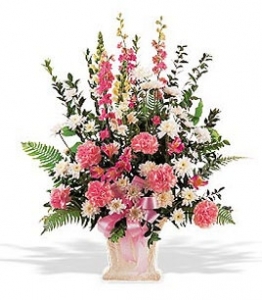 This popular sympathy flowers tribute features soft pink and white blooms, such as carnations, alstroemeria, cushion poms, larkspur, snapdragons or similar favorites. 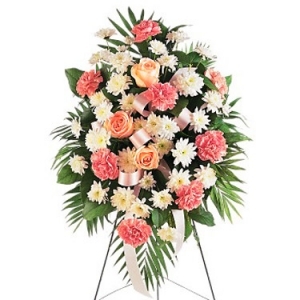 Express your deepest condolences with this stylish tribute of colorful fresh flowers, such as roses, Gerbera daisies, larkspur, carnations, spray roses, snapdragons or similar seasonal fresh favorites. 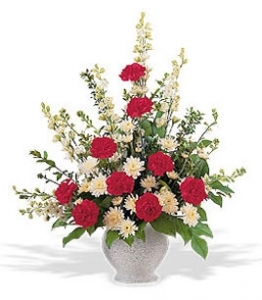 This classic sympathy arrangement features red and white blossoms with fresh foliage in a traditional triangular tribute design. A lovely combination of seasonal fresh flowers in pretty lavenders, whites and complimentary hues. 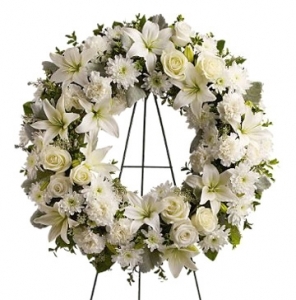 An elegant outpouring of pure white blossoms in an eternal ring to symbolize unending hope and caring. 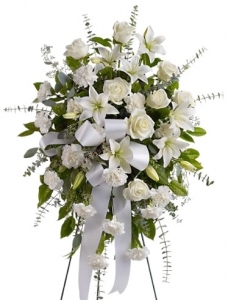 This lovely sympathy expression features beautiful white flowers, such as roses, lilies, carnations or similar favorites, in a classic standing easel spray. 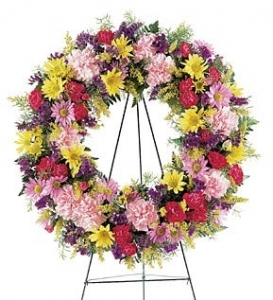 This very popular funeral wreath features hearty seasonal fresh flowers in a rich tapestry of Spring colors. 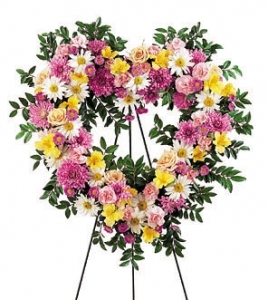 A tasteful design of pretty pastel flowers in an ageless heart-shaped spray. 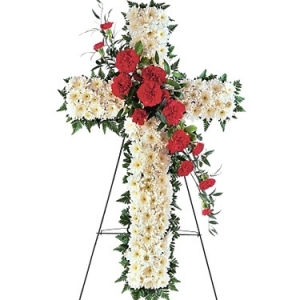 A beautiful cross of soft white blossoms with a cluster of deep red carnations, too. 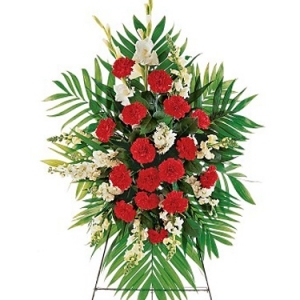 A red and white sympathy spray featuring flowers such as, include carnations, gladioli, snapdragons, stock or similar seasonal blooms. 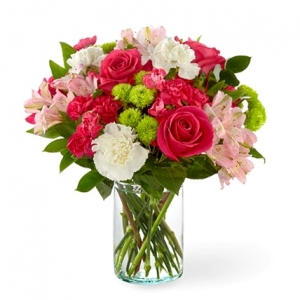 Send a touching message of sympathy and support with this thoughtful spray of pink carnations and white chrysanthemums accented with delicate pink or peach roses. Appropriate for wakes, funerals and memorials.